If you're looking to post Tweets across multiple Tweeter accounts, while following influencers and monitoring keywords, TweetDeck is your ideal time-saving solution, particularly if you're on a tight budget, as TweetDeck is completely free of charge! 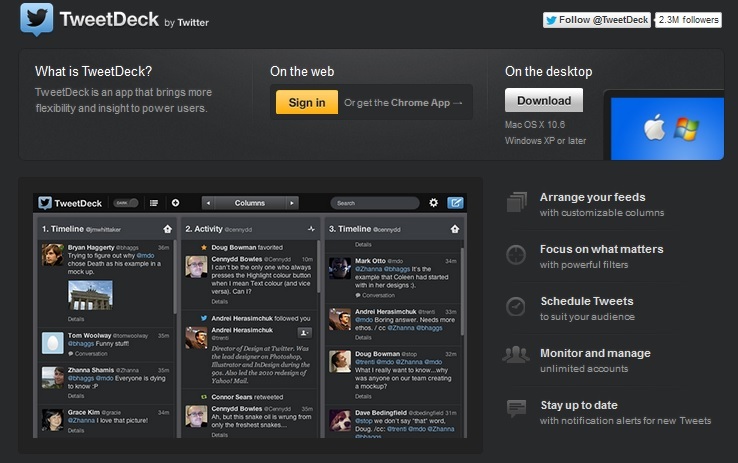 TweetDeck is a platform specifically designed to manage multiple Twitter accounts under one roof. It is certainly one of the more established social media platforms on our list, and has grown in strength over the years, especially with the $40M buyout that came from Twitter themselves back in 2011. TweetDeck is aimed at a broad audience who operate a selection of Twitter accounts, and want to make life easier by combining them into one place. 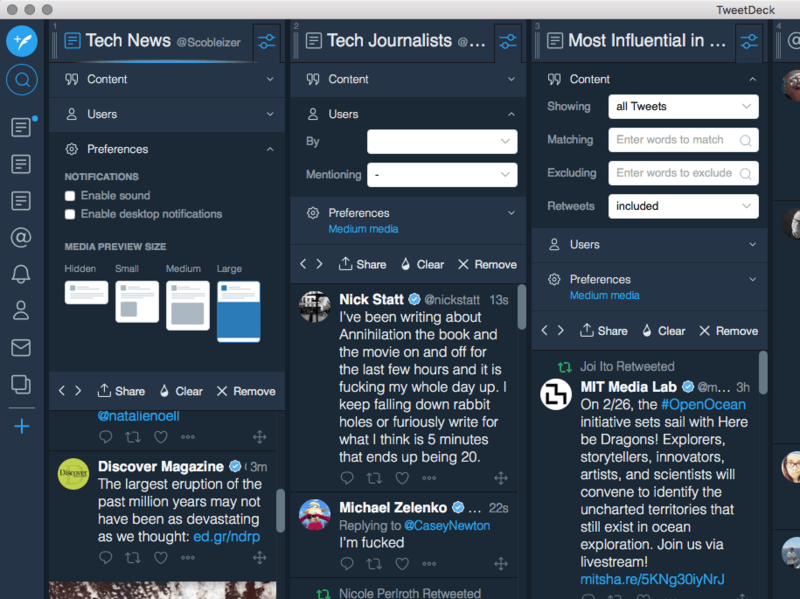 The beauty of TweetDeck is in the streamlined dashboard, where you can monitor conversations, users or keywords, interact and engage with potential new customers, and post directly from the TweetDeck platform to multiple Twitter accounts simultaneously. Best of all is you don’t have to pay to use the program, it’s absolutely free of charge with no catches! Wondering if TweetDeck is the best option for your social media strategy? When signing up to TweetDeck, don’t expect to see a range of incredible features that change the way you go about your social media strategy, because this is one area that the platform is seriously lacking on. There is no team management, tracking, analytics or bulk message scheduling available like some paid programs offer. However, some may say that keeping it simple works well, and if you need to create flexible streams based on searches, keywords, and mentions then TweetDeck will allow you to do this with ease. Furthermore, you can also engage in real-time with potential customers and current customers, keeping your finger firmly on the pulse. Publishing posts via the TweetDeck interface is super easy: Simply write your post, add your hashtags, images, videos and links. TweetDeck will notify you if you exceed the 140 characters limit, to make sure your post will be displayed correctly on Twitter. If you have multiple Twitter accounts, you can choose which profiles to post from, and schedule posts individually to when you see fit. Although you cannot bulk schedule posts, you do get the pleasure of scheduling multiple posts, which is a major time saver. Scheduled posts are also streamlined, so you can see exactly when each of your posts is due for publication, and on which Twitter profiles. 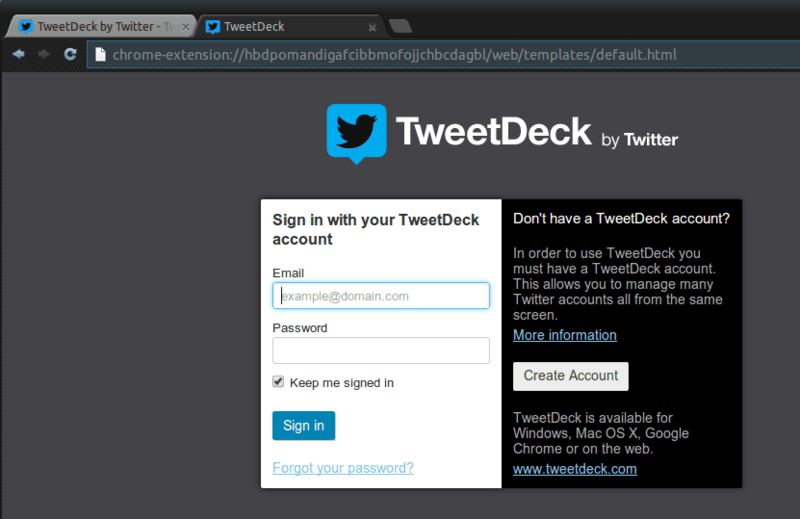 There are a few reasons why TweetDeck gets a perfect usability score. Firstly, it is available across all devices. They have a web-based desktop app, a mobile app for both iOS and Android, and a Google Chrome app. All three synchronize with each other perfectly, making it easier to post on Twitter wherever you are. In the settings tab, there’s an option to change to width of each column, allowing you to display more columns whilst preserving your space. However, if you don’t want to display more columns you can use the Column Navigator dropdown at the top, to easily switch between any columns you have created. Finally, with TweetDeck there is no confusion or unnecessary buttons that you’ll never use. The interface is simple, clean and incredibly clear. They Seem To Be Hiding Away! TweetDeck is so basic in what it does, there isn’t much need for any kind of support, but the support you do get is just one link off the bottom of the TweetDeck site, and it takes you over to a help section in the main Twitter.com website. Once there, you will see a few written guides on how to make the most out of the features TweetDeck has to offer and how to setup your account. Human-to-human conversations via live chat or email is not available with TweetDeck. What can we say, it’s free! For once, there isn’t much to talk about here, TweetDeck doesn’t offer any range of paid packages or upgrade features for its services. To put it simply, you just need to sign-up for an account and everything you see is yours to explore. There are no restrictions in place; there is no need to buy credits for extra services. It’s free of charge to everyone, everywhere and you even get the feature to add unlimited accounts!